We had to put Kate down a few months ago. I was thinking about her this week and realized I still (and probably will) always miss her. She was an extraordinary dog. We'll be back on Tuesday. First of all, apologies that I didn't get around to posting this last week. Sometimes real life intervenes, and last week it did. The monthly data last week almost univerally stunk, including the first decline in the LEI in over a year. This week there was evidence of continued recovery, but also more evidence that the pace of recovery may be slowing and possibly even stalling in some sectors. That the Chicago PMI's employment index fell all the way into contraction is particularly unwelcome news, suggesting that manufacturers are reacting to the Euro meltdown by slamming on the brakes once again. Aside from that, durable goods orders was up 2.9% and nondefense capital goods orders, a leading indicator, were up 9.2%. This series is very noisy, and Boeing's airliner sales play a uniquely strong role. Consumer sentiment also increased, to levels not seen since before the recession. Personal spending was flat, but personal income increased a strong 0.4%, giving a slight boost to real income as well since prices declined slightly in April. The ICSC reported that year over year sales were up 1.3% from last year for the week ending May 22nd. They were down -0.8% from the previous week. Last week YoY sales were up 2.9% and down -2.5% from the week before. As we are in between shopping seasons, weekly declines are not a surprise, but the health of the consumer reacting to the latest financial scare is an important item to watch. Shoppertrak did not report this week, but last week reported a very good 6.5% increase YoY. The price of Gas fell from its high of $2.90 two weeks ago to $2.79 this week. The 4 week average of usage last week was 9.20M gallons vs. 9.05M. The pice of Oil, which was down as low as $67 earlier this week, is back up near $75. The BLS reported 460,000 new jobless claims last week, after a high reading of 474,000 last week. 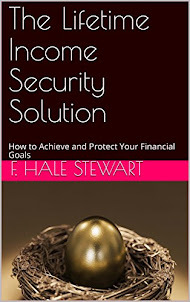 Last week's reading is of particular concern, since it suggests this aspect of recovery is stalling. Unfortunately we have no way of knowing from what sector this continued elevated level of layoffs is coming from. The American Staffing Association's weekly index of temporary employment again increased, up 0.65%. Rail traffic remains up from last year, but its comparative increase has stalled for three weeks now, indicating at least a pause in the strength of the recovery. Daily treasury receipts continue their upswing compared with last year. Through May 29, 2010, $116.6B had been collected vs. $114.1 a year ago, up 2.3% vs. 18 reporting days into May of last year. Everybody have a happy and safe Memorial Day weekend. Intel Corp., the world’s largest maker of computer chips, is increasing production and commanding higher prices as an export boom puts American manufacturing at the forefront of the economic recovery. Santa Clara, California-based Intel’s factories are operating at 80 percent of capacity, up from a record low of about 50 percent last year in the midst of the recession. The average selling prices of personal computer processors have risen a total of 12 percent over the past two quarters. Overseas demand for U.S.-made goods from semiconductors to printers is boosting the fortunes of manufacturing, which has been shrinking as a proportion of the economy in 13 of the past 14 years. As a result, trade may add to growth for the first time in a post-recession year since World War II, says Morgan Stanley economist Richard Berner. Net exports, or the difference in value between what the U.S. sends overseas and what it buys from abroad, will add about 0.3 percentage point to gross domestic product this year, according to Berner, Morgan Stanley’s co-head of global economics in New York. He forecasts economic growth of 3.4 percent in 2010 after last year’s 2.4 percent contraction. Consumer delinquency rates are dropping at U.S. retailers and banks such as American Express Co. and Bank of America Corp., signaling an incipient lending thaw that may spur economic growth. Past-due loans at Bank of America, the second-largest card lender, fell for a fifth month in April and by the most in four years, while AmEx’s delinquencies were down 34 percent from a year earlier. Target Corp., the second-largest U.S. discount retailer, last week reported its lowest delinquency rate in the latest quarter since the second quarter of 2008. 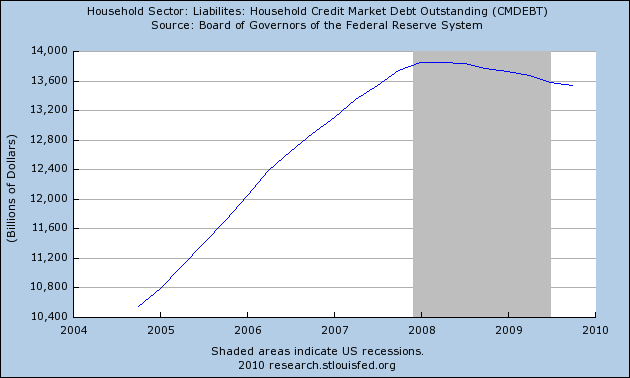 Starting in 2008, households started to decrease their debt holdings. 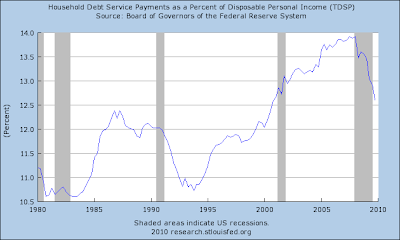 Considering the overall level (there was nearly as much household debt as GDP) this was a healthy development. 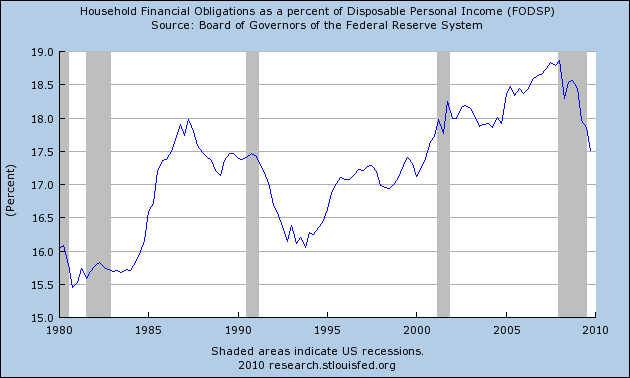 The household financial obligations as a percent of disposable income. Analysts said there was a heightened belief that Asian economies and the US could decouple from the problems in Europe. “The theory of a decoupling of the rest of the world from the problems in the eurozone seems to be taking hold, following the theory frequently heard in 2008 of the emerging markets decoupling themselves from the recession of the industrialised world,” said Ulrich Leuchtmann at Commerzbank. He said the reasoning was obvious: the exposure of the financial systems in Asia and the US to the stricken countries of the eurozone was small and economic effects were small as Asia, not Europe, was the engine of the global recovery. “It makes no difference short-term whether the decoupling theory is correct or not,” said Mr Leuchtmann. I agree the selling was overdone. The EU has proposed a $1 trillion dollar package to help with the situation. Governments are cutting spending (which is good and bad at the same time). In short -- action is being taken. HOWEVER, anytime I see the word "decoupling" I laugh. The reality is the world is incredibly inter-connected now; there is no way the impact of one region does not impact another region. It's just not possible. Witness the inverse trading relationship between the dollar and the euro. Let's start with an observation about where the markets are. Starting a few weeks ago, traders grew concerned about the EU situation. They sold risk assets (stocks and commodities) and moved into less risky assets (bonds and the dollar). This situation became more and more concerning as the movement continued. However, there are now signs of a bottoming and a reversal of that situation. But it's important to remember that curing the problem will take time -- a single day's price action won't accomplish the task; it will take several days of activity in a variety of markets. On the daily chart, equity prices pierced the 200 day EMA (a) yesterday although the volume could have been better. However, the EMA picture remains bearish (b) with the shorter EMAs moving lower and the shorter EMAs below the longer EMAs (the 10 is below the 20 and the 20 is below the 50). On Tuesday, the market opened lower but rallied strongly throughout the day (a). This was a very good development. However, on Wednesday the markets sold-off at the end of the day (b) out of concern about China possibly diversifying out of EU assets. Yesterday, China stated this was not the case and the markets opened higher and then rallied throughout the day (c). The MACD is very close to giving buy signal (a) and the A/D line indicates money is flowing into the security. The dollar may be printing a double top with the appropriate smaller volume on the second top. 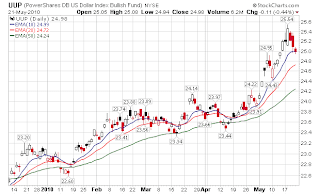 However, both of these charts are bearish (the euro) and bullish (the dollar). That is, what we have is a price formation indicating a possible reversal but we still have strong indications that the overall trend is still in place. Also note the MACD is giving a sell-signal (b) and the A/D line is moving lower. Also note in the long-end of the Treasury market we have a possible island reversal in place (a). Also note that yesterday's price action (b) gapped lower and the 10 day EMA has moved lower, albeit it for only a few days. In yesterday's market post I noted the gaps in the long-end of the curve's rally and wondered whether we possibly saw an exhaustion gap prior to the island. Oil may have turned the corner as well. Prices have moved though the 10 day EMA (a), the MACD is giving a buy signal (b) money is moving into the security (c). Buy the Dip or Beginning a Bear Market? U.S. stock markets are oversold and may rally strongly in the next few days, said investor Barton Biggs, who runs New York-based hedge fund Traxis Partners LP. “I think they’re going to stabilize in this general area, and then we’re going to have a significant move to the upside,” Biggs, whose flagship fund returned three times the industry average last year, said in a Bloomberg Television interview. Biggs recommended buying U.S. stocks last year when benchmark indexes sank to the lowest levels since the 1990s. The Standard & Poor’s 500 Index rallied 23 percent in 2009 as governments worldwide mounted stimulus programs to counter a recession. On March 22 this year, Biggs told Bloomberg TV U.S. stocks had the potential to rally a further 10 percent. The S&P 500 has since declined 8.4 percent. His views are at odds with Eric Sprott, manager of the best-performing Canadian mutual fund with at least $1 billion in assets in the past 10 years. The S&P 500’s month-long slump is the beginning of a collapse that will drive the measure below its weakest level of 2009 in the next year, Sprott said. The $1 trillion European rescue package announced May 10 has failed to stop the global equity slump, indicating investors are skeptical that efforts to address the debt crisis will work, said Sprott, who manages the Sprott Canadian Equity Fund. He’s buying gold and betting against stocks. Note that since the beginning of the year, this number has been moving sideways between ~450,000 and ~490,000. As I noted at the beginning of the week, we've got to see this number start to move below 450,000. Today's drop is obviously good news, but the number is still at extremely uncomfortable levels for where we are in the economic cycle. Real gross domestic product -- the output of goods and services produced by labor and property located in the United States -- increased at an annual rate of 3.0 percent in the first quarter of 2010, (that is, from the fourth quarter to the first quarter), according to the "second" estimate released by the Bureau of Economic Analysis. In the fourth quarter, real GDP had increased 5.6 percent. The GDP estimates released today are based on more complete source data than were available for the "advance" estimate issued last month. In the advance estimate, the increase in real GDP was 3.2 percent (see "Revisions" on page 3). The increase in real GDP in the first quarter primarily reflected positive contributions from personal consumption expenditures (PCE), private inventory investment, exports, and nonresidential fixed investment that were partly offset by negative contributions from state and local government spending and residential fixed investment. Imports, which are a subtraction in the calculation of GDP, increased. The deceleration in real GDP in the first quarter primarily reflected decelerations in private inventory investment and in exports, a downturn in residential fixed investment, a larger decrease in state and local government spending, and a deceleration in nonresidential fixed investment that were partly offset by an acceleration in PCE and a deceleration in imports. 3% is still a good number and indicates the economy is expanding. Also note the data is broad based -- PCEs, inventory investment (which is real economic grown) and non-residential investment. Yesterday, the market gapped higher at the open (a) but had a lot of downward pressure. first prices moved to the 50 minute EMA, then rallied, but fell again to the 200 day EMA (c). Then prices fell hard through all the EMAs (d) on heavy volume. Considering the technical damage done to the markets, yesterday's price action -- especially at the close -- was disappointing and indicates there is tremendous nervousness among traders regarding the market still. On the daily chart, notice that prices are clustering between roughly 105 and 109. However, the EMA picture is still extremely negative (b) with all heading lower, the shorter below the longer and prices below all the EMAs. The MACD (c) indicates there is a tremendous lack of momentum. However, the A/D line indicates we may not have seen the tremendous actual flight from the market as we'd think during a sell-off like this. This may be more of a "trading shares" situation where people who purchased a year ago are taking profits and new investors are looking for the market to move higher. On the two indexes that track risk capital, notice that prices are clustering above the 200 day EMA -- staying in bull market territory. Industrial metals are in a clear downtrend (a) with consolidation points along the way (b and c). However, notice the volume -- there was a big spike about two weeks ago (d) but the level of intensity is decreasing (e). Notice the MACD (b) is very close to giving a buy signal and the A/D line reversed about a week ago (b). Finally regarding the DBBs, notice the price action over the last 8 days fits in a trading range of roughly 1 point (18.30 - 19.40). With the long-term Treasury market, notice the uptrend is still intact (a) and the EMAs are still bullish (b). However, we have three gaps in the uptrend (c). I am wondering if the last gap is an exhaustion gap. This would make sense given the high volume we're seeing printed in this area. Gold spent 6 days moving lower in two downward sloping channels (a and b). However, it gapped higher Monday morning (c) moved higher for two days (d) and gapped higher again at the beginning of yesterday's trade (e) and then moved sideways (f). On the daily chart, prices (b) have moved over the uptrend (a) and the EMA picture is strengthening (c). However, the volume is decreasing (d), indicating fewer investors are participating. THE STOCK MARKET STAGED an impressive recovery from steep early losses Tuesday, but was it a case of the symptoms being relieved while the underlying cause of the malady remains? Reports that North Korea had put its military on alert last week supposedly in preparation for a confrontation with the South over the North's alleged sinking of a South Korean only served to upset markets already anxious about the European debt situation. The latter was encapsulated in a single interest rate, three-month Libor, or the London interbank offered rate. This money market benchmark continued its upward creep, rising another three basis points (.03 percentage points) and a total of seven basis points over the past five trading sessions. That sounds trivial, but in percentage terms that's significant, given the rise brought Libor to 0.53625%. That's roughly double Libor's level early in the year and the highest since early 2009, when the worst of the credit crisis was fading. Remember that the federal funds target set by the Federal Reserve has remained unchanged throughout at 0-0.25%. The widening in the spread between the Fed-set overnight funds rate and three-month Libor, which is set by a survey of major international banks by the British Bankers Association at late morning in London, reflects the higher rates that some European banks are having to pay. The money market is demanding a premium from banks, especially those that own lots of bonds from the weak-credit governments of Greece, Portugal, Spain, Ireland and Italy. Notice the huge jump in the short-term rates in the US at the height of the financial crisis. While Libor is nowhere near those levels, a sharp increase in short-term rates is indicative of problems in the financial market. That's what the real issue is here. Orders for durable goods rose in April for the fourth time in five months, pointing to strength in U.S. manufacturing at the start of the second quarter. The 2.9 percent increase in bookings for goods meant to last at least three years was the biggest in three months and followed little change in March, figures from the Commerce Department showed today in Washington. Orders excluding transportation unexpectedly fell after revisions showed even bigger increases in prior months. Rising exports and lean inventories are prompting companies to place more orders with factories, keeping factories at the forefront of the recovery from the worst recession since the 1930s. Corporate and consumer demand that stokes more job growth may help the expansion weather the European debt crisis. I use to joke they should report this number ex-Boeing, but that hasn't caught on. Instability in sovereign debt markets poses another serious risk. It has highlighted the need for the euro area to strengthen its institutional and operational architecture. Bolder measures need to be taken to ensure fiscal discipline, says the Outlook.Several countries are already taking early action to enhance the credibility of their fiscal consolidation plans and this is very welcome. “This is a critical time for the world economy,”said OECD Secretary-General Angel Gurría. “Coordinated international efforts prevented the recession from becoming more severe but we continue to face huge challenges. Many OECD countries need to reconcile support to a still fragile recovery with the need to move to a more sustainable fiscal path. We also need to take into account the international spill-overs of domestic policies. Now more than ever, we need to maintain co-operation at an international level.” (Read the full speech). 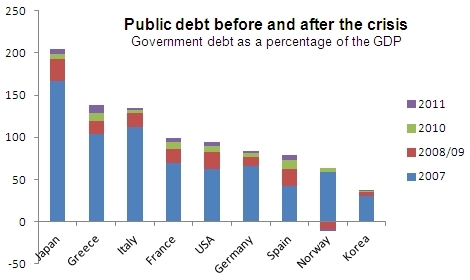 With a huge debt burden weighing on many OECD countries and the strengthening recovery, the emergency fiscal measures provided by governments to tackle the crisis must be removed by 2011 at the latest, the Outlook says. It adds that the pace of such action must be appropriate to particular conditions and the state of public finances in each country. Calculated Risk was one of the first people that I can remember who noted the US has a structural budget problem, caused by a variety of factors. In an ideal world, the government should increase spending as the economy slows to ameliorate the effects of the downturn, but should then decrease spending as the economy grows. That obviously does not happen in the real world. Compounding that problem is the fact the US went into the financial crisis in terrible fiscal shape at a time when they needed to spend money to prevent the meltdown. When I advocated for the spending programs a few years ago I ran some back of the envelope debt/GDP calculations to see where we would be in a worst case scenario -- no GDP growth and massive debt growth. Assuming that, we would have a debt/GDP of right around 100% in 4 years. 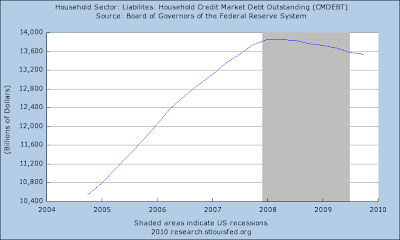 Currently, we have about $12.9 trillion in debt versus a GDP of $14.6 trillion giving us a debt/GDP ratio of 88%. While this is not good, it certainly is not fatal. I think the OECD is sounding the warning bell early in the hopes of getting everyone's attention regarding the problem. One of the things I constantly harp on is the misuse of "year over year" comparisons. Sometimes we have to use them, due to seasonality (housing for example). When I use them, I am always careful to tease out the trend -- i.e., is the YoY comparison getting better or worse. If you don't, you make bad, bad mistakes like Mike Shedlock did when he unintentionally bottom ticked Rail traffic a year ago (when the 13 week trailing YoY average was at its worst, but the more contemporary 4 week YoY average had been improving). Well, today, over at the Big Picture, in Positive Sign: Worker Mobility, Barry Ritholtz uncharacteristically falls into the trap, with regard to Daily Treasury withholding. One of the data points that has been getting some attention is the total withholding tax receipts, as reported by the IRS. That certainly is a possibility. Might there be a better, higher probability explanation? - The 2009 tax cut that impacted the vast majority of salaried workers. There is a much simpler explanation. King's supposition is rubbish. 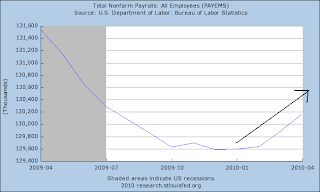 Withholding data in no way supports the position that "jobs are still decreasing." The "year over year" data that King cites is fiscal year to date. He is comparing October 1, 2008-May 20, 2009 with October 1, 2009-May 20, 2010. If we want to find out if "jobs are still decreasing" (present progressive tense) or not, why the h*ll do we want to include old data? In other words, in the first period YoY receipts trailed by about -9%. In the second period, they trailed by -5%. 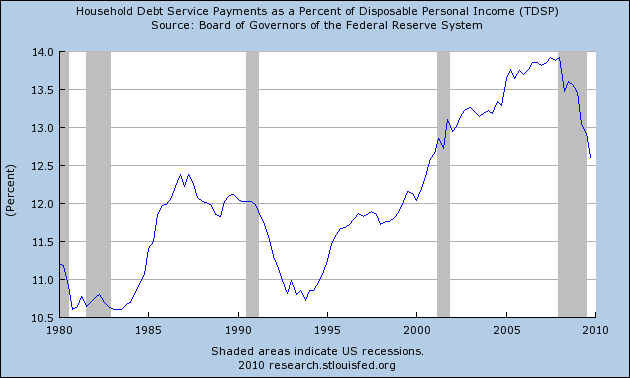 In the final period, 2010 receipts exceeded 2009 receipts by about +5%. The only reason "fiscal year to date" YoY receipts are still (barely) negative is because they haven't been positive YoY recently (about 3 months) for as long as they were negative YoY previously (about 5 months). 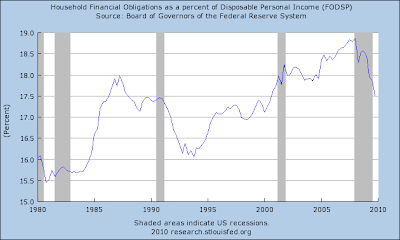 Looking at withholding taxes YoY fiscal year to date is a horribly lagging way to look at the data. 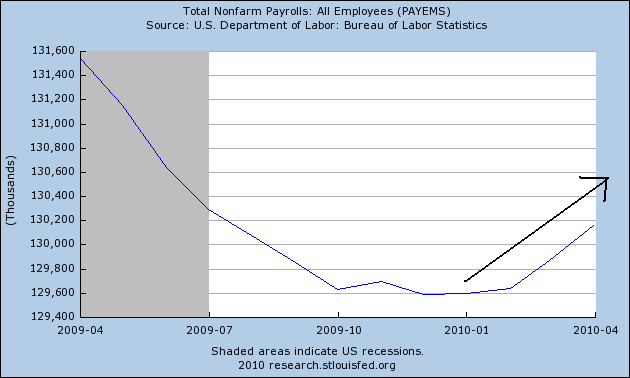 The correct reading of the data is: "Jobs were still decreasing until about February 2010. Since then jobs are increasing. Very robustly, thank you very much." King's analysis is garbage and it is surprising that Ritholtz falls into the trap. Considering the market's overall technical condition, we'll need a few days worth of price action in a variety of markets in order to say things are OK. However, yesterday was a good start in that direction. Prices gapped lower at the open (a) but rallied throughout the day. Prices initially rallied to just below the 50 minute EMA (b) then corrected in a downward sloping channel (c). Prices then rallied strongly into the close (d) printing a very strong volume bar (e) at the end. The Treasury market has rallied as the stock market has fallen - basically batching a flight to safety bid. Yesterday prices gapped higher at the open (a), then went into a down (b), up (c) down (d) pattern. However, the last leg down (d) had a volume surge, indicating a higher amount of participants getting out of the market. The dollar has also benefited from a flight to quality at the expense of the euros fall. However, yesterday after gapping higher, the dollar continued to move lower, finding upward resistance at various EMAs (a, b, c) throughout the day. Also note that momentum was moving lower throughout the day (d). Currencies are at the center of recent market turmoil. As the euro has fallen, the dollar as risen, leading to a drop in commodity prices. However, it's possible we're nearing a turning point. For the dollar, momentum is close to giving a sell signal (b) and the A/D line has dropped (c) indicating a move from the ETF. However, the EMA and price picture are still very bullish. For the euro, the MACD is close to giving a buy signal (a) and we're seeing money flow back into the security (b). Data through March 2010, released today by Standard & Poor's for its S&P/Case-Shiller Home Price Indices, the leading measure of U.S. home prices, show that the U.S. National Home Price Index fell 3.2% in the first quarter of 2010, but remains above its year-earlier level. In March, 13 of the 20 MSAs covered by S&P/Case-Shiller Home Price Indices and both monthly composites were down although the two composites and 10 MSAs showed year-over-year gains. Housing prices rebounded from crisis lows, but recently have seen renewed weakness as tax incentives are ending and foreclosures are climbing. The majority of metropolitan areas saw a price decrease last month. However, the mix of decreases and increases appears to be pretty mild. The composite move of 10 cities was -.4% and the composite move of 20 cities was -.5%. Consumers gained more confidence in May than projected as a recovering U.S. economy raised expectations hiring will pick up in coming months. The Conference Board’s confidence index rose to 63.3, exceeding all estimates of economists surveyed by Bloomberg News and the highest level in two years, according to a report from the New York-based private research group. Other figures showed home prices rose less than projected in the year through March. Employment gains in five of the past six months may be helping overcome the damage from slumping stock prices as investors fret the European debt crisis will slow global growth. Meantime, the looming end of a government homebuyer tax credit signals property values may stagnate for the rest of the year as foreclosures mount. “I’m relatively optimistic that we’ll get through the European debt crisis without dire economic consequences, but the jury is still out on that one,” said Stephen Stanley, chief economist at Pierpont Securities LLC in Stamford, Connecticut. Home prices “are going to drag along the bottom for a while until we get a better handle on the overhang” of inventories. While the improvement is good (and welcome) note that confidence is still at low levels and needs to rise further. This is a key to watch. The higher it gets, the worse it will become. The Obama administration made a strong plea to Congress on Monday to grit its teeth and pass a new set of spending measures – dubbed the “second stimulus” by some economists – in order to help dig the economy “out of a deep valley”. The call for action, which was made by Lawrence Summers, Barack Obama’s senior economic adviser, who urged Congress to pass up to $200bn (£138.9bn) in spending measures, came at the same time as Mr Obama asked Capitol Hill to grant him powers to cut “unnecessary spending”. Let's hope Congress can do the right thing and pass this with a heavy emphasis on infra-structure spending. let's start with a chart of the SPYs, because a close examination of price movements indicates some extreme negativity. a.) Prices rally throughout the day, but sell-off going into the close. b.) Prices gap down slightly at the open, but also sell-off late in the day. c.) Prices gap down hard at the open and never come close to recovering. g.) Prices formed a rounding pattern and again sold-off at the end of the day. A big issue with the last 10 days of trading is no one wants to hold a position overnight. That tells us that traders are extremely nervous about the overnight news cycle. Gold is in an interesting position. It originally caught a safety bid a little over a week ago, but has since sold off to just below the upward sloping trend line (a). Also note the two short-term trend lines (the 10 and 20 day EMA) have moved lower, indicating short-term negativity. Finally, the volume trend (c) appears that Gold had a selling climax over the last few weeks. Commodities in general have been hit hard over the last few weeks as the dollar has strengthened and treasuries have risen. The main point with the dollar market is prices are now below one of the upward sloping trendlines. Like the SPYs, the oil market is also extremely negative right now. a.) Prices sell-off mid day and can't rebound. e.) Prices gap higher at the open but then fall for the entire trading day. The primary beneficiary of this trend is the long-end of the Treasury market, which is in a clear uptrend. For those of you who read Afraid to Trade, welcome. Corey is one of the best technical analysis on the web and we are pleased to have him mention our blog on his. Starting sometime last summer the economic numbers started to turnaround, indicating an economic trough was forming. Since the end of last summer a variety of economic indicators have experienced improvement. Included in these numbers are initial unemployment claims, the ISM manufacturing and service index, various regional federal reserve manufacturing indexes, the rate of establishment job losses, personal consumption expenditures and the equity markets. However, several events have either culminated or occurred in the last few weeks that raise yellow flags regarding the US' economic expansion. This does not mean the sky is falling or that Armageddon is approaching. But it does mean this is a good time to look at exactly what has happened and determine the net possible negative effects on the current US expansion. You can click on any chart to get a larger chart in a new window. Notice that 400,000 and below is the "normal" rate for initial unemployment claims during an expansion (at least it has been during the last four expansions). Last week's increase to 471,000 is troubling for two reasons. 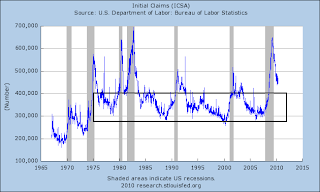 First, the number has been moving sideways since the beginning of the year, indicating the improvement in initial claims has stalled. 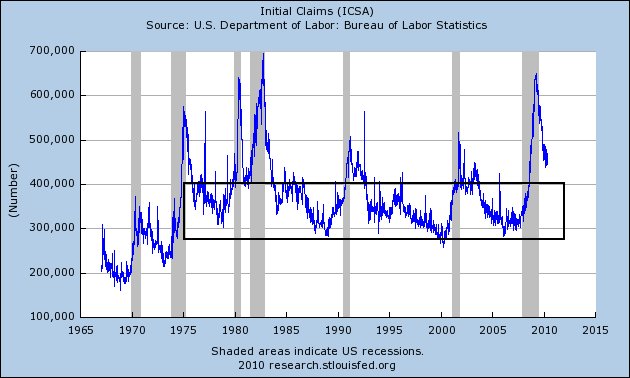 Secondly, last week we saw a sizable increase in initial claims. Had the increase been a smaller number it would not have registered. But the size of the increase in combination with the length of time this number has been moving sideways raises a yellow flag. Since the beginning of the year, total establishment jobs have increased 559,000. This occurred during the same time the initial unemployment claims started to move sideways between 450,000-500,000. This indicates there may be a disconnect between initial claims and establishment job growth. The euro has moved from 151.44 near the end of last year to a close of 125.64 on Friday, a drop of 17% in about 5-6 months. That's a pretty severe drop in a fairly short period of time that indicates a loss of faith on the part of investors in the euro area. Also note that prices are at important technical levels established at the end of 2008 and again in early 2009. 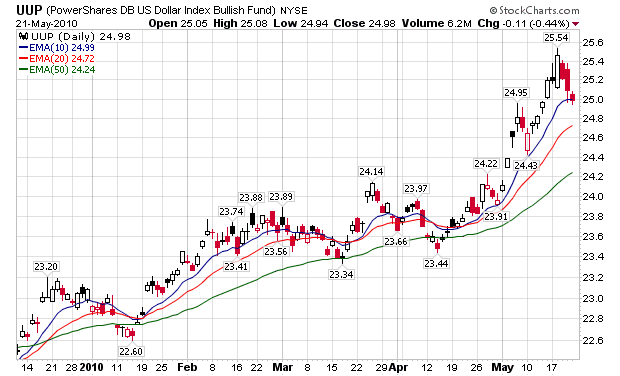 Below is a chart of the UUP -- the bullish dollar ETF which shows how the dollar has appreciated in value over the last six months. As the dollar has increased in value, we've seen a corresponding decrease in commodity prices. Adding to the downward pressure is news from China that the People's Bank of China is increasing reserve requirements to slow their economy down. Because China is one of the largest consumers of commodities, we've seen additional downward pressure on all major commodity groups. Agricultural commodities have been decreasing for the last six months; they are in a clear downward price channel. Industrial metals have dropped over the last few weeks, partly in reaction to China and partly in response to an increasing dollar. Oil has also dropped hard and is at its lowest point in the last six months. This is before the summer driving season, which usually adds an upward bid to oil prices. Decreasing commodity prices are adding to deflationary issues, which were discussed in more detail here. One month Libor is near yearly highs. So, the central issue is a decreasing euro, which has led to an increasing dollar, which in turn has led to decreasing commodity prices. Recent reserve tightening issues in China have added downward pressure to commodity prices, which adds further evidence to the argument the US is facing an increased possibility of deflation. Economic indicators fall into one of three categories: leading, coincident and lagging. The leading indicators rise/fall before the general economy, the coincident indicators increase/decrease with the general economy and the lagging indicators increase/decrease after the general economy. The conference Board has taken the leading indicators and made a "leading indicator index" which it publishes every month. The Conference Board Leading Economic Index®(LEI) for the U.S. declined 0.1 percent in April, following a 1.3 percent gain in March, and a 0.4 percent rise in February. Says Ken Goldstein, economist at The Conference Board: "These latest results suggest a recovery that will continue through the summer, although it could lose a little steam. The U.S. LEI declined slightly for the first time in more than a year, and its six-month growth rate has moderated since December. Meanwhile, the coincident index, a measure of current economic activity, has been improving since mid-2009." Manufacturer's new orders and supplier deliveries dropped. This is hits the manufacturing sector which has been a big part of the turnaround. Coordinate this data with the drop in the Empire State index (which dropped but is still positive) and a possible slowdown may be in the works (although today's Philly Fed was positive). Building permits are way down, impacting housing, construction employment and construction/home improvement retail (Home Depot, Lowe's etc.). Home retailers had reported some good numbers recently. Money supply dropped which hits everyone. Consumer expectations dropped, hitting retail sales. So, we have one month of a drop, but the underlying reasons for the drop are pretty broad based. This, in conjunction with the rise in initial unemployment claims, raises a yellow flag until we get more data. 1.) A decrease in initial unemployment claims below the 450,000 level. In addition, the economy needs to keep up its current pace of job creation. Last month we had a great employment report. That needs to be repeated in the next report. 2.) The euro needs to stabilize. The European Union has proposed a massive $1 trillion dollar package, which was announced several weeks ago. However, the euro has continued to drop since that announcement. Markets are now concerned that austerity programs will hurt overall economic growth. A close look at the FXE indicates the euro may be in the middle of a selling climax. But the only way to make this determination is in hindsight. 3.) Commodity prices need to rebound. An across the board drop in commodity prices indicates the markets think decreased demand is an issue going forward. An increase in commodity prices will indicate demand is picking up. 4.) The decrease in the LEIs is not fatal and probably indicates the US will be seeing a decreased rate of growth in the second half of the year. There are two extremely positive developments from this chain of events for the US economy. 1.) Cheaper oil. Oil prices are one of the biggest threats to US recovery. At current levels, they are hardly a threat. 2.) Lower interest rates. As money has made a "flight" to quality, we've seen a rally in Treasury Bonds which has lowered yields. Overall, these developments indicate the rate of expansion in the US will probably slow over the next 3-6 months.